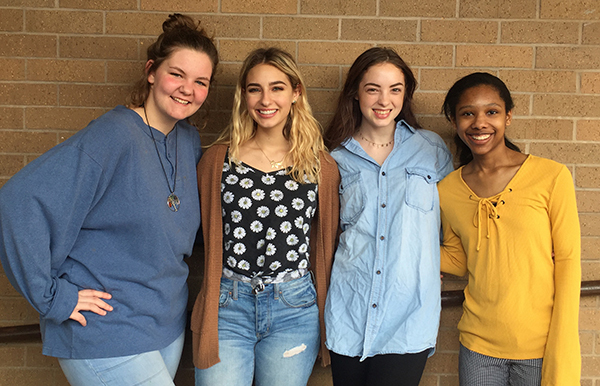 Texarkana, TX – A four-student team from Texas High School has been named one of 14 Division II UIL State Qualifiers in Theatrical Design. They will advance to the state contest which will be held April 14 at the University of Texas in Austin. Members of the state qualifying team are: Bree Barnett, Blaire Berry, Elicia Bilyeu and Katie Dusek. Each member school in Texas is allowed to enter one group entry portfolio based upon the theatrical design directorial prompt given by the UIL. The portfolio must have a unified who design concept focusing on set design, costume design, hair/makeup design and marketing design. This year’s selected show was Stephen Sondheim’s Into the Woods. Teams were prompted to use the original script but with the idea of reviving the story for our time thereby making the musical relevant to millennial audiences.